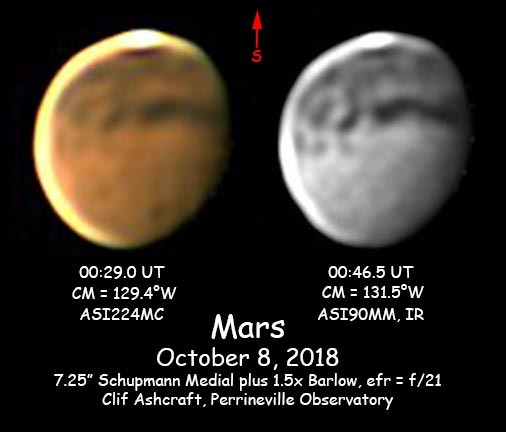 Mars observations from 2018 - 2019 - wa2guf's JimdoPage! February 5, 2019. Warm weather for a change, no clouds. 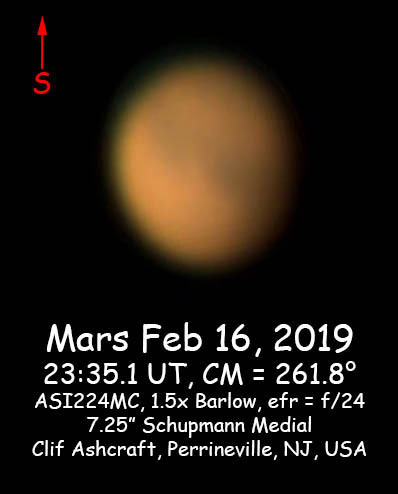 I observed Mars with the 7.25" Schupmann tonight, fitting it with a 1.5x Barlow and the ASI224MC one shot color camera. I used an exposure of 3.0 ms and took ten videos of 90 seconds duration. Each video had 29647 frames. I used Autostakkert 2 to align and stack the best 25% of the frames in each video and then sharpened the images using the wavelets of Registax6. 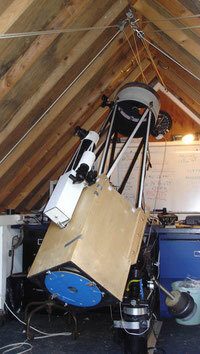 WinJUPOS was then used to derotate and stack the ten images. The result is shown below. 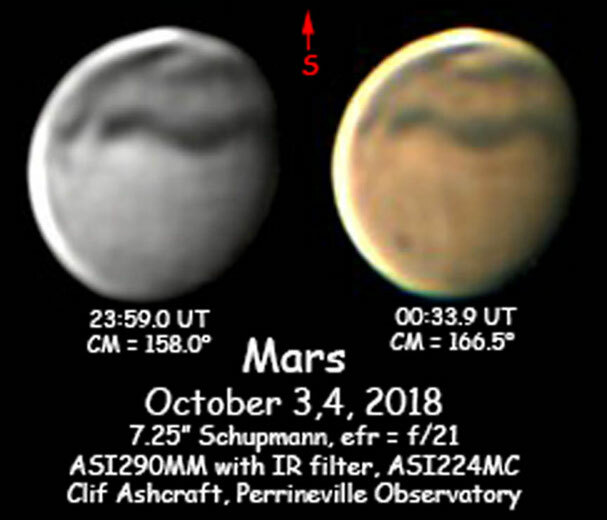 Mars is only 5.96 arc seconds across, yet features can be recognized. Notable are Sinus Meridiani near the center of the image and Hellas in the upper left. Syrtis Major is on the eastern limb (left) and only visible as a slight darkening. I see no trace of the South Polar cap. January 15, 2015. Got a set nine 90 second videos of Mars tonight in average seeing and bitter cold. 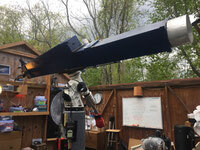 Nice altitude of 48 degrees, but the tiny diameter of 6.7 arc seconds is not much to work with. This is only 4 times the apparent diameter of Ganymede when Jupiter is at opposition. Still, some features are visible, notably, Mare Cimmerium, Mare Chronium and just a trace of a South Polar cap. Again, no signs of dust storm activity. January 14, 2015. There have been reports of renewed dust storm activity on Mars. 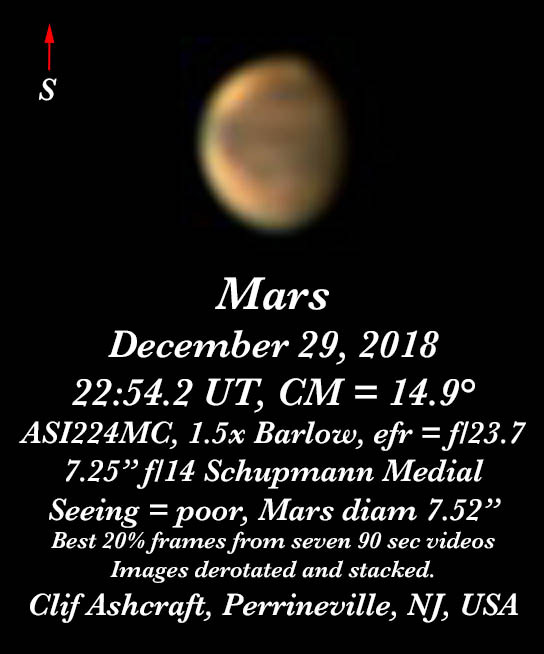 I was able to capture six 90 second videos of Mars in the late twilight tonight in fairly good seeing using my ASI224MC one shot color camera and a 1.5x Barlow on my 7.25”, f/14 Schupmann Medial. 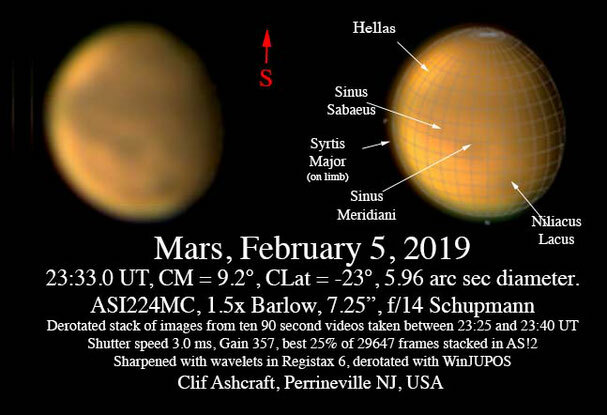 Mars is only 6.8 arc seconds across now in imaging the tiny disk is a challenge. 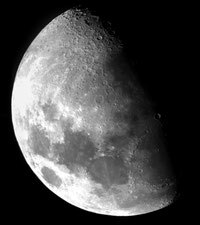 By derotating and stacking the images prepared from the best 25% of 34,055 frames from each video using AS2!, Registax and WinJUPOS I got the attached image. The central meridian is 218.5 degrees crossing Mare Cimmerium and Elysium. I don’t see much evidence of any dust storm activity on this side of Mars tonight. December 29, 2018. 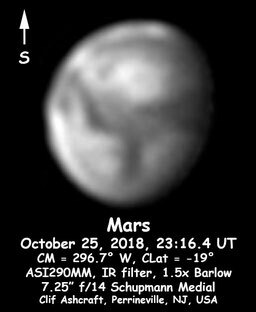 Seeing was rather poor tonight, but Mars is higher now and although rather small (only 7.52 arc seconds across) some detail can still be seen. A tiny south polar cap is visible and the bright patch on the upper right limb is the great depression Hellas. 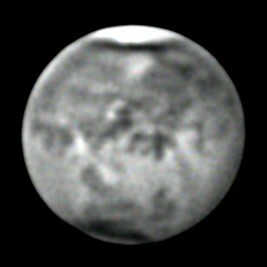 Sinus meridiani is visible just below and left of center. December 13, 2018. Seeing was quite poor and the sky had scattered clouds when I used FireCapture to take three 90 second videos with the ASI224MC connected to the 7.25" f/14 Schupmann with a 1.5x Siebert Barlow lens. Each video had 34,055 frams taken with an exposure of 1.7 milliseconds and a gain of 416. I aligned and stacked the best 20% of the frames of each video using Autostakkert!2. The resulting images were sharpened in Registax6, derotated and stacked in WinJUPOS and again slightly sharpened with wavelets in Registax to give the resullt shown below. The central meridian is 167.9° west longitude. The dark band above center is Mare Sirenum. December 7, 2018. 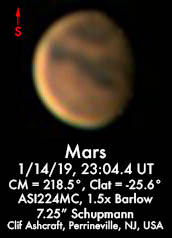 Mars was at an altitude of 42 degrees when I began my observations at 5:25 pm, and only 8.8 arc seconds in diameter. I used the ASI224MC (coupled to the 7.25" f/14 Schupmann with a 1.5x Siebert Barlow lens) to take a set of nine videos of 90 seconds duration. Exposure was 1.8 milliseconds and gain was 386 and I obtained 41459 frames in each video. I processed the videos with Autostakkert 2, aligning and stacking best 25% of the frames and sharpened with wavelets using Registax6. These 9 images were then derotated to a common meridian of 226.0° West Longitude and stacked again. In spite of the tiny disc size and poor seeing, there are numerous identifiable features. Not the tiny size of the South Polar Cap. 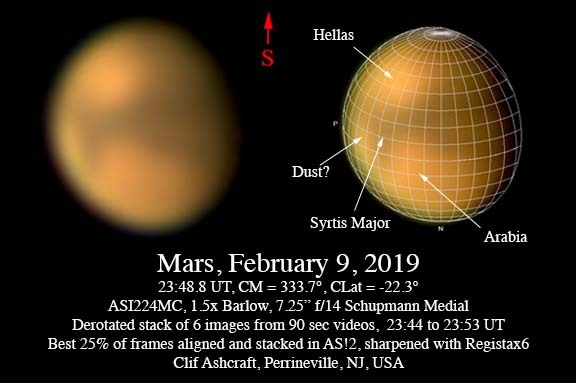 Mars has rotated 32 degrees west since my previous observation on December 4, bringing Mare Sirenum into view and rotating Hellas past the terminator. 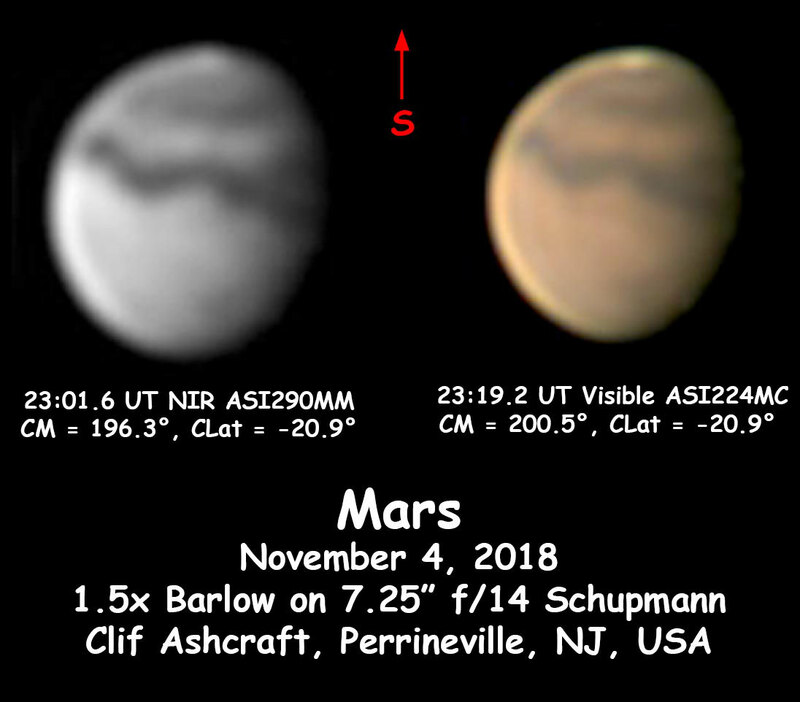 December 4, 2018 As Mars recedes from us, it is also getting to be a bit easier to observe. 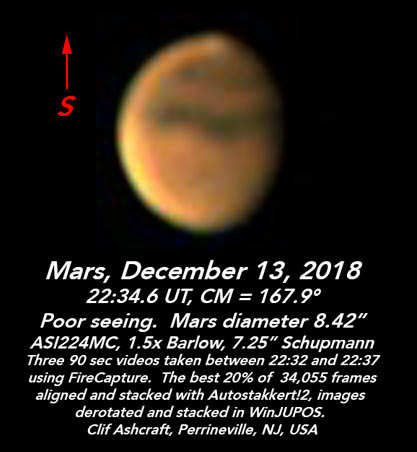 When I took my videos tonight, Mars was at an altitude of about 42 degrees, much less atmosphere to look through than at the 24 degrees at opposition at the end of July. Still it is very small, only 9.0 degrees tonight. In spite of this, many identifiable features can be seen in the attached image. It is the derotated stack of 8 images from 90 second videos taken between 5:39 pm and 5:50 pm tonight. Only the best 5% of the frames from the videos were stacked. Since I had plenty of frames from the ASI224MC, I went back and reprocessed the seven videos, keeping only the best 5% instead of 25%, then derotated and stacked to give the final image. In the attachment, it is enlarged 2x and 4x. When I look at them critically, they all seem to be similar in resolution, just magnified to different scales. If I were given the task of measuring surface features against a grid, or making a picture for hanging on the wall, I would go for either the 2x or 4x depending upon how far away the picture was to be viewed. Keeping 5% of the frames instead of 25% resulted in a real improvement in resolution. I also think I did a better job lining up the overlay in WinJUPOS. You cannot trust the location of the polar cap. 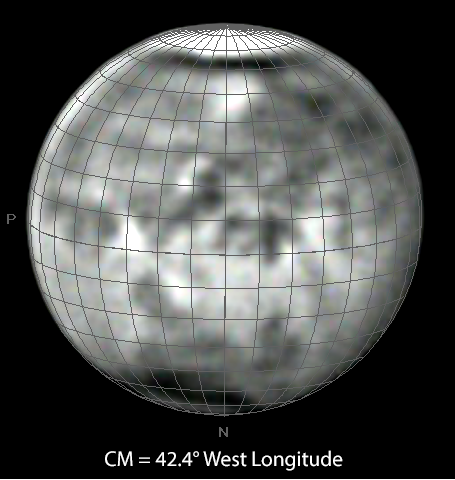 You need to match the curve of the terminator with the overlay and check the latitude of any prominent feature you can see well. 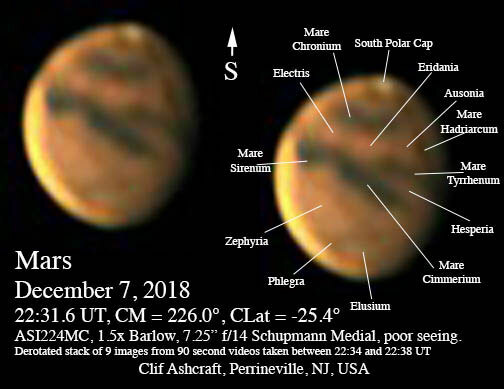 As Mars is getting further away from us, It is actually getting a bit easier to image since the altitude of the ecliptic is getting higher, now 38 degrees at meridian crossing. Seeing was predicted to be above average and I believe it actually was. I observed Mars tonight using the 7.25” Schupmann fitted with a Siebert 1.5x Barlow giving about f/21. Imaging was with the ASI290MM monochrome camera plus 850nm long pass filter and the ASI224MC one-shot color camera with a NIR blocking filter. I took seven 90 second videos with each camera, then aligned and stacked the best 25% of the frames in each video using Autostakkert2, and sharpened with wavelets in Registax6 and finally, derotated and stacked the images with WinJUPOS. 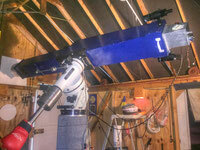 The central meridian was 11.7 degrees for the NIR image and 15.5 degrees for the color image. Central latitude was -23.9 degrees for both images. The attachment shows the final result. Dust is almost clear now and the color image is noticeably higher in resolution than the NIR image. Hellas is the bright region on the bright limb above center and Sinus Meridian is just below center. 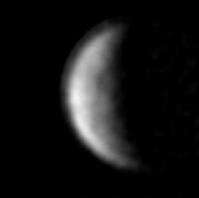 The dark feature near the terminator in the North is Mare Acidalium. November 11, 2018. 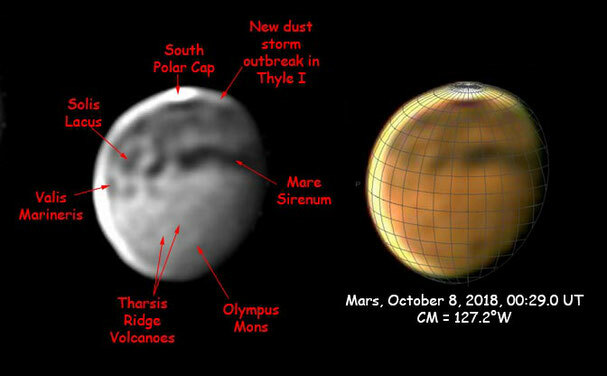 Solis Lacus, Olympus Mons and a greatly shrunken South Polar Cap are visible in the color image of Mars taken when it was only 10 arc seconds across. Still lots of dust in the atmosphere, but the visible light image is beginning to show more detail than the NIR image. November 4, 2018. 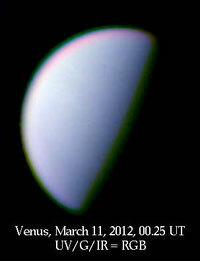 Here are images taken this evening in both near infrared and visible light. I believe some clearing of the dust storm is in progress, but the atmosphere is still hazy. Seeing was fair. November 3, 2018. It was very windy today, but calmed down after sunrise. Examination of Mars with a 35mm Plössl/1.5x Balow showed a nearly featurless disk after carefully tuning out the atmospheric dispersion using the field mirror micrometer adjustments, I took a set of seven 60 second videos using the ASI290MM camera fitted with the 850nm longpass filter and coupled to the 7.25" f/14 Schupmann with a 1.5x Siebert Optical Barlow lens. The videos were aligned and the best 5% stacked with Autostakkert2, sharpened with Registax6 and derotated and stacked again using WinJUPOS. 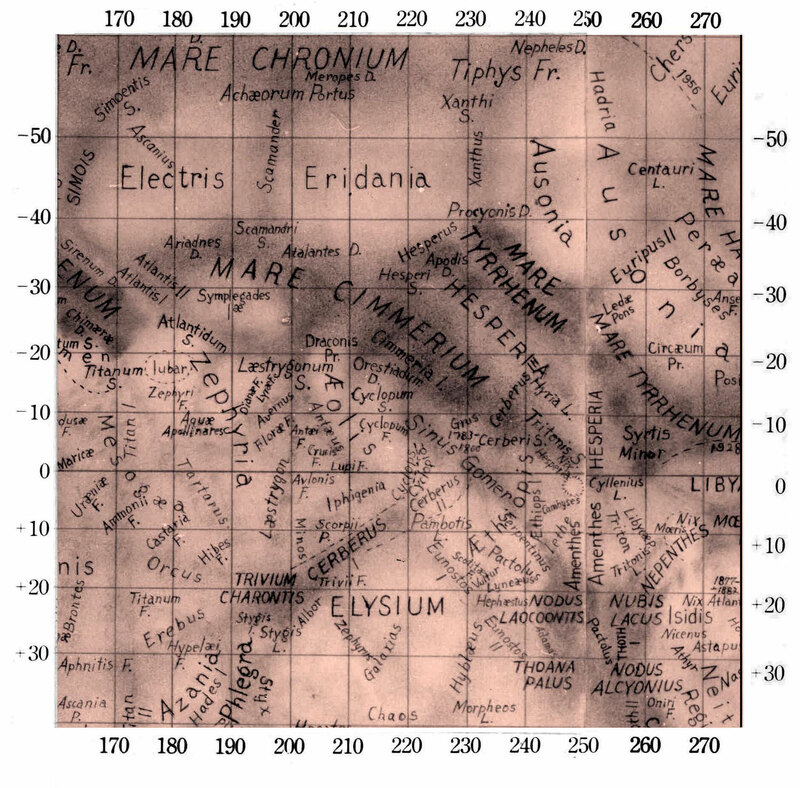 The central meridian in this image is at 214.4° west longitude over the eastern part of Mare Cimmerium, the dark diagonal stripe going from just above the center of the image towards the terminator on the right. Estending to the east as a U shaped dark strip is Mare Sirenum. The high albedo regions above Mare Cimmerium and Mare Sirenum are Electris on the left and Eridani on the right. South Polar cap is almost gone. November 1, 2018. Shown above is a montage of all the images I have taken so far this opposition. Most were obtained with the 7.25" f/14 Schupmann Medial described in another page on this website, some were obtained with the C14, usually stopped down because of seeing, and the image of August 6 was obtained with the Schupmann Medial in MacGregor Observatory at Stellafane. 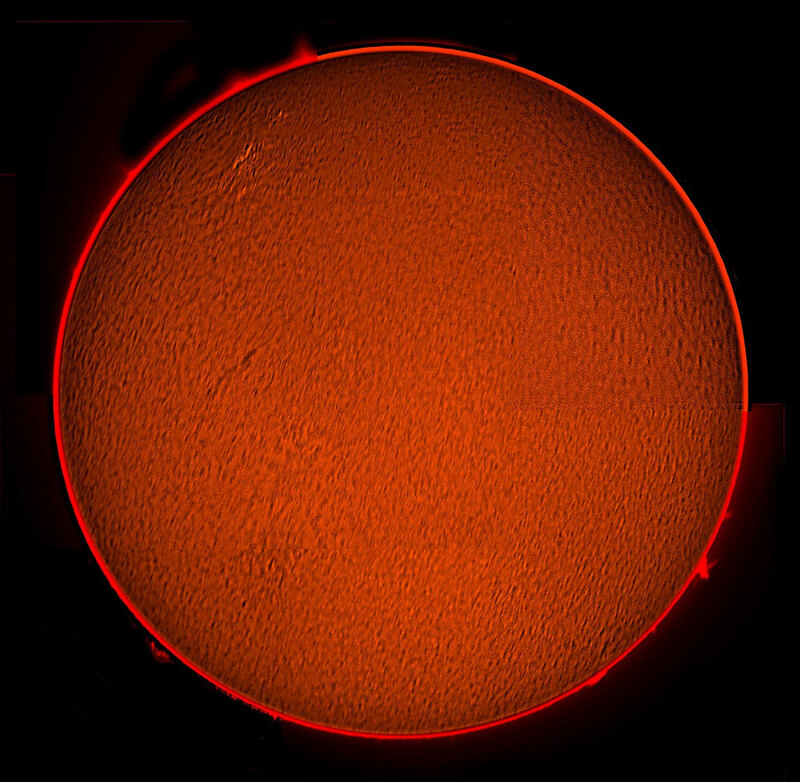 The color images were obtained with the ASI224MC and the black and white with the ASI290MM with either a red (July 20) or an 850nm longpass IR filter. There are a few pairs of images taken on the same night in color and NIR. See August 17, September 6 and October 3/4. Seeing has been quite variable this opposition, but generally poor due to the presence of the Jet Stream over NJ most of the time. South is up in all the images which are rendered approximately to scale showing the wide range of angular diameters before during and after opposition. October 31, 2018, Halloween! 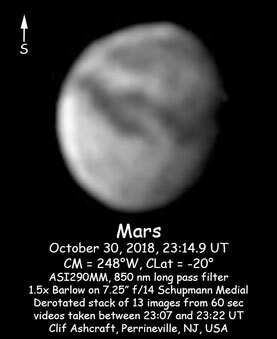 Skies were partly cloudy tonight with Mars occasionally visible through breaks in the overcast. Seeing was a little better than last night. 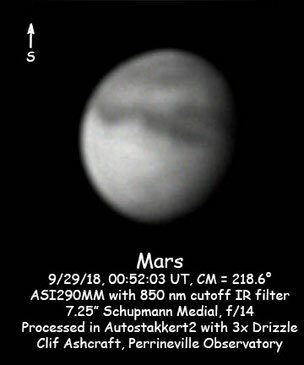 I used the ASI290MM camera (fitted with the 850 nm longpass filter , this gives me a NIR bandwidth from 850 to 1000 nm, coupled to the 7.25", f/14 Schupmann Medial, efr ~f/21) to capture six one minute videos between 8:12 and 8:19 pm EDT (00:12 to 00:19 UT on November 1, 2018), each having about 2854 frames. 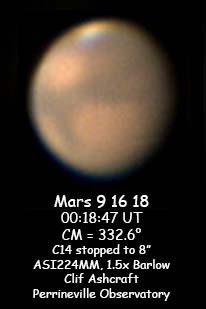 Mars was only 11.87 seconds of arc across. Tiny image. I processed the videos with AS!2, keeping only the best 5% of the frames, sharpened in Registax6, then derotated and stacked using WinJUPOS to give the image shown below. We see the low albedo regions Mare Cimmerium and Mare Tyrrhenium as diagonal stripes across the middle of the image and the high albedo regions Electris, Eridania and Ausonia just above them (left to right). The South Polar Cap is the small white spot at the top. Looks like the dry ice (CO2) part of the cap has completely evaporated leaving only the permanent water ice portion. Only a vague indication of the dark features were visible to the naked eye. The atmosphere is still pretty hazy from the dust storm. October 30, 2018. Skies were clear tonight, but the seeing was poor. I set up the ASI290MM camera on the Schupmann with 850nm long pass IR filter and 1.5x Barlow giving about f/21. I then took a set of 13 videos of 60 seconds duration using FireCapture with a gain of 273 and a 26 ms exposure. Each video had 2268 frames. 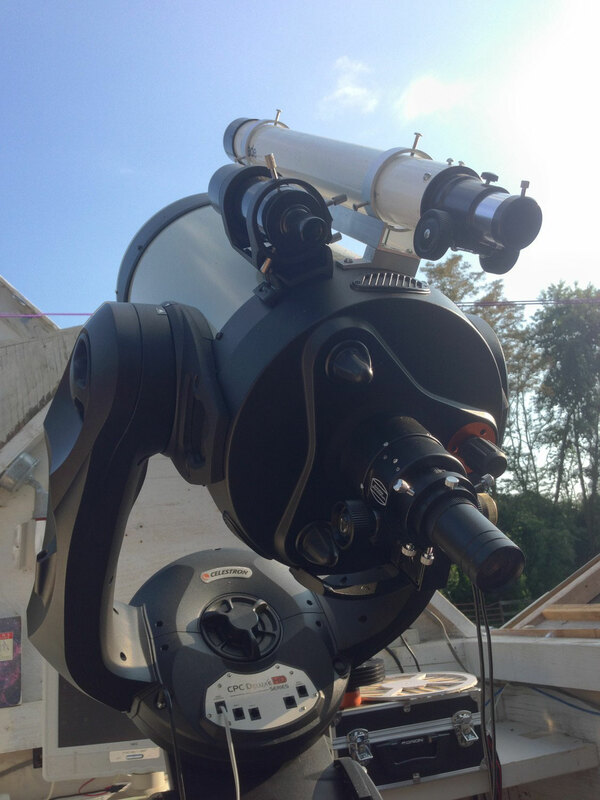 Autostakkert2 was used to align and stack the best 5% of the frames in each video and the result was sharpened in Registax6. The resulting 13 images were derotated and stacked in WinJUPOS to give the final result shown at the left. The Central Meridian of this image is 248°W Longitude. The dark albedo features crossing the center are Mare Cimmerium and Mare Tyrrhenium. Syrtis Major is overthe terminator on the west (right) side of the image. October 25, 2018. Tonight the sky was somewhat hazy and the seeing was poor, but imaging in the IR gives pretty good results anyway. IR penetrates the haze on earth as well as the dust on Mars. 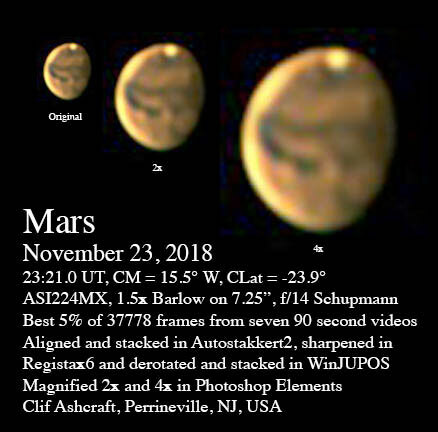 I used the ASI290MM camera fitted with the 850 nm long pass filter and a 1.5x Barlow to capture a set of 14 one minute videos of Mars using the 7.25” f/14 Schupmann Medial. After aligning and stacking the best 5% of the frames in each video, I derotated the resulting images in WinJUPOS and stacked them again. The final image, somewhat better than last night is shown at the left. October 24, 2018. 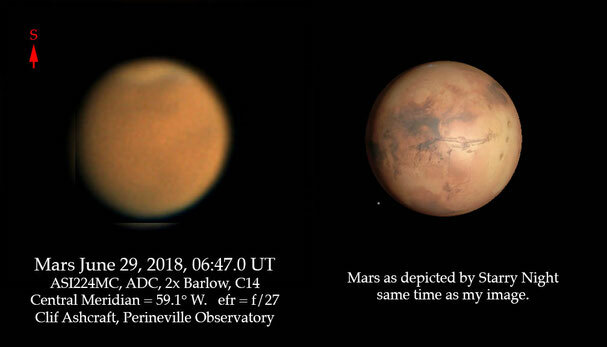 Mars is getting smaller, only 12.6 arc seconds tonight. I took a set of 25 one minute videos with the ASI290MC fitted with the 850 nm cutoff long pass filter and 1.5x Barlow on the 7.25” Schupmann tonight. The bandpass from this filter and the CMOS detector is 0.85 to 1.0 microns in the NIR. The effective focal ratio was about f/23. Seeing was somewhere between awful and poor. I processed the videos in Autostakkert3, Registax6 and WinJUPOS to give the attached image which is a derotated stack of all 25 of the images from the videos, keeping only 5% of the best frames. The central meridian is 300.5 degrees west and the central latitude is 18.9 degrees south. We see Syrtis Major below center and the great impact basin Hellas above center. The white region to the left of Hellas near the limb may be another dust storm, as may the light spot just to the left of Syrtis Major. This has been a very dusty opposition. No signs of a real clearing. 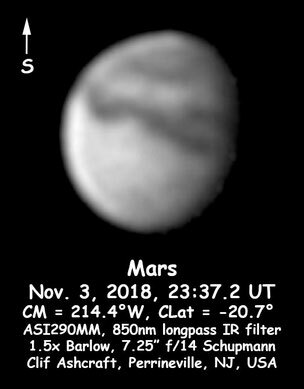 A brief look through the eyepiece before the imaging session just showed a nearly featureless planet with occasional glimpses of the south polar cap and a vague indication of the dark albedo features so prominent in this infrared image. October 7, 2018. It was not a very promising day for astronomy: overcast, occasional rain, Clear Sky Chart prediction for essentially zero transparency, however, the jet stream prediction looked very good with the high velocity region well north of NJ. When I went out to check the sky at 6:30 pm, I noted that although quite hazy, the sky was relatively cloud free. 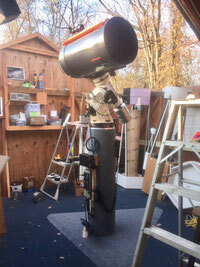 So, I opened up the observatory and pointed the 7.25" f/14 Schupmann Medial to Mars which was still behind a tree. I began imaging at 7:22 pm in the late twilight using the ASI290MM camera fitted with the 850 nm cutoff long pass IR filter and the 1.5x Barlow giving about f/21. With this filter, scattered blue light from the sky is essentially invisible and one can observe in the daytime with no difficulty. I recorded data for one minute using an exposure of 23 ms and a gain of 323. I took an additional 25 one minute videos until 8:11 PM. At this point, I switched over to my ASI224MC one shot color camera and continued imaging at f/21 taking 90 second duration raw undeBayered 8-bit videos. I took color data until 8:42 pm by which time I had taken 12 color videos. At this point I switched back to the ASI290MM and IR filter and took another 9 one minute videos in monochrome IR. I processed all 47 videos in Autostakkert3! keeping 10% of the best of 2800 frames in each of the IR videos and 5% of the 34,000 frames in each of the color videos. Registax6 wavelets were used to sharpen the tif files created by AS3!. 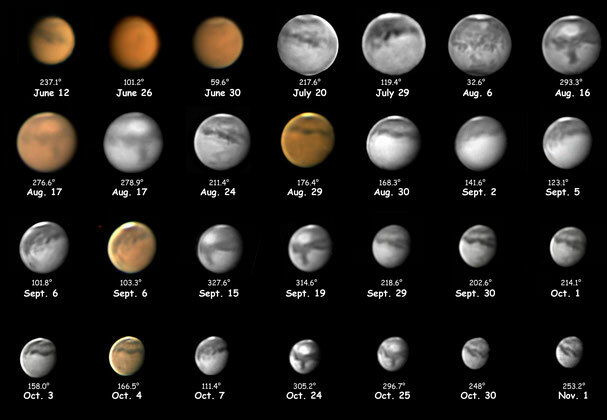 The 12 color images and the last 9 infrared images were derotated and stacked using WinJupos to give the images shown below. In these views of Mars, centered around a central meridian of 130°W, we see a prominent Solis Lacus, left, just above center, as well as Olympus Mons and the volcanoes of the Tharsis Ridge. The volcanoes show up as dark smudges in the visible light image where we only see the summits poking up through the dust that still obscures the lowland regions of Tempe, Tharsis and Acadia. The infrared image lets us see all the way to the surface where the volcanoes show up in relief with bright south eastern slopes and dark north western slopes. The recent dust storm outbreak in Thyle I can just be seen on the terminator to the right of the South Polar Cap. See labeled version of the IR map above. October 3, 2018. 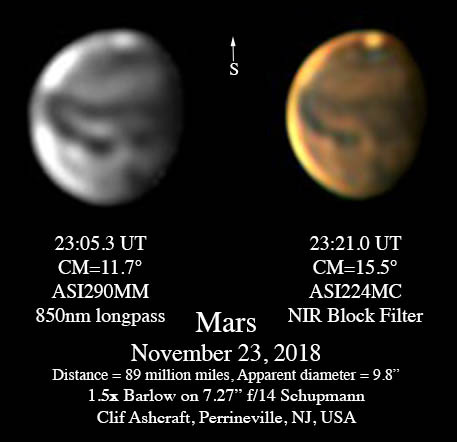 The images below were obtained with the Schupmann medial, 1.5x Barlow and the ASI290MM camerafitted with the 850 nm cutoff IR filter and with the ASI224MC one shot color camera. In both cases the efr was f/21. Olympus Mons is prominent in the visible light image as a dark smudge in the lower left of the image where the summit of the volcano sticks up through the dusty lower atmosphere. 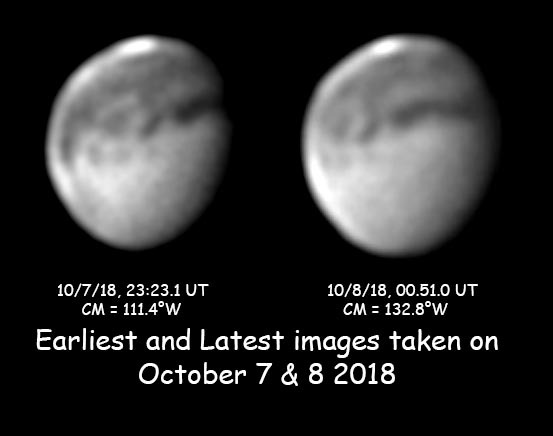 It can also be seen in the IR image in relief with the south eastern slopes lit up by IR from the sun penetrating the dust. The north western slope is in partial shadow. A new outbreak of this season's dust storm may be seen in the Thyle I region. It is the yellowish streak extending to the western limb from just below the South Polar Cap. It was not present in my images from September 30. September 30, 2018. Mars was bright in a nearly clear sky this evening. First look through the Schupmann showed a bit better seeing than last night, about average for New Jersey. 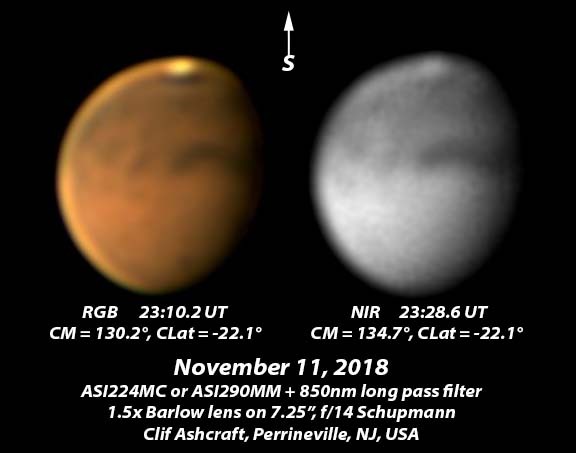 I attached the ASI290MM camera, with the 850 nm cutoff IR filter to the f/14 focus of the telescope and proceeded to capture twelve one minute videos of Mars between about 9:45 and 10 PM EDT. I processed them in Autostakkert2 using 1.5x drizzling to ensure good sampling, keeping the best 15% of about 11,000 frames per video. I then derotated and stacked the 12 images in WinJUPOS to give the image shown at the left. Elysium Planitia is seen near the bottom (North) of the disk near the terminator. 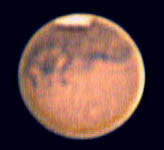 The dark strip across the disk above center is the region from Mare Sirenum to Mare Cimmerium. The nearly featureless light region on the lower left of the disk is the Amazonis region of the nothern abyssal plain where the younger Mars probably had an ocean. September 29, 2018. 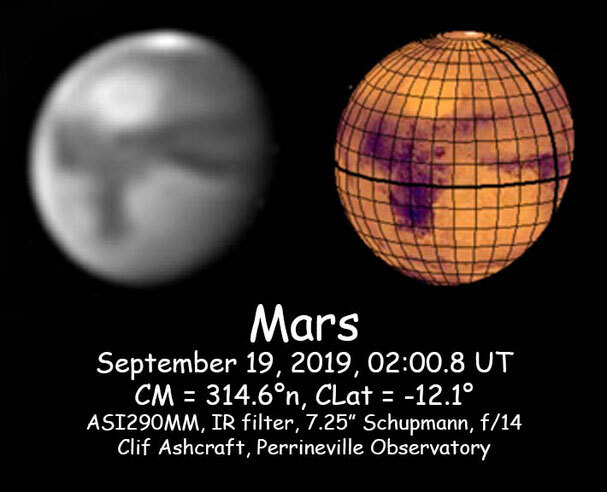 It was mostly clear tonight with fair seeing when I took 22 one minute videos of mars with the ASI290MM with an infrared filter attached using the 7.25” Schupmann Medial at f/14. 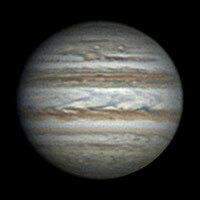 The best 15% of the 8500 frames were aligned and stacked in Autostakkert2 and sharpened with wavelets in Registax6. All 22 images were then derotated to a common CM in WinJUPOS and stacked. 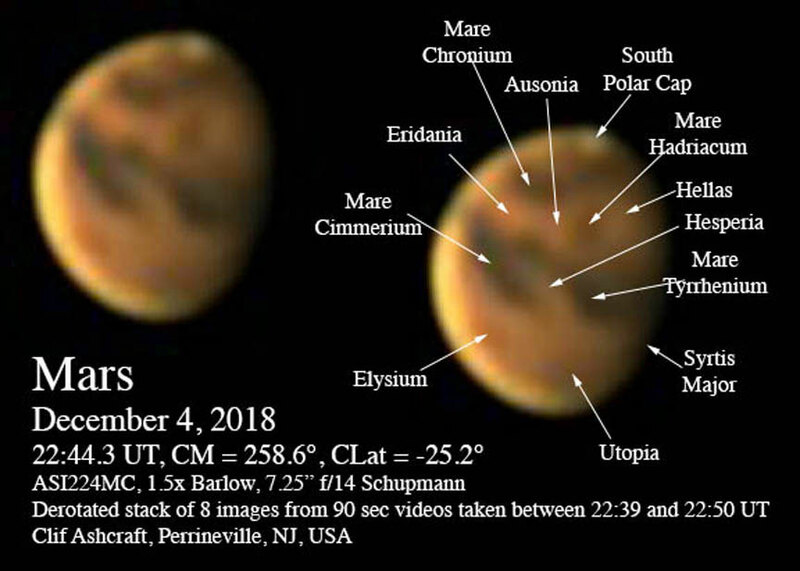 This final image is shown above compared with an albedo map textured globe prepared for the same CM and CLat in WinJUPOS as well as the appropriate section of the BAA map of Mars. Note the region from 160 degrees to 200 west longitude and about 30 degrees south latitude that has a dark albedo indicating removal of light dust from underlying dark rock. Elysium Planetia and Elysium Mons is in the lower right near the terminator. An animated GIF was also prepared from the 22 images. It is shown here. September 28, 2018. 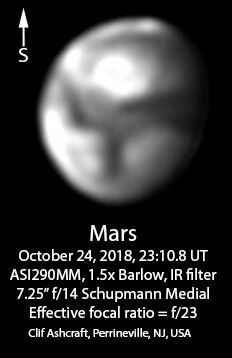 Seeing was only fair tonight when I obtained this image of mars, not as good as it was on August 24 when I previously imaged this face of Mars. At the left is one of 4 images I obtained tonight at the f/14 focus of the 7.25” Schupmann Medial using the ASI290MM camera fitted with an 850 nm cutoff IR filter. Processed with Autostakkert2 using 3x drizzling and sharpened with Regisatx6. We see Mare Cimmerium and Elysium in this view. The South polar cap has almost sublimed away. Tomorrow night is predicted to be better seeing. August 23, 2018. Seeing was definitely above average tonight. Predictions were not as favorable as what I got. 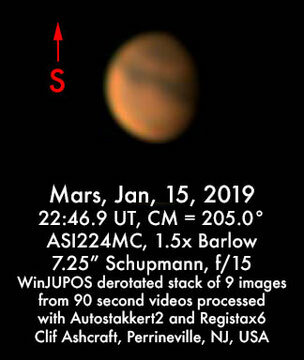 I was able to collect a series of videos, all with the 850 nm cutoff IR filter and ASI290MM with 1.5x Barlow on the 7.25" Schupmann Medial showing the transit of Io and Europa on Jupiter, several videos of Saturn and a set of 14 one minute videos of Mars. They covered CM = 208.8° W.Longitude at 02:00.1 UT up to 214.1° at 02:21.8 UT. I assembled them into an animated GIF using GIMP. The animation is shown below. 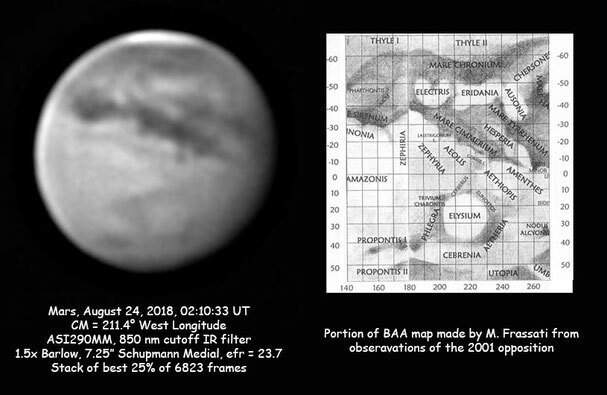 An enlarged version of the image from the video taken at 02:10 UT is shown above along side of a portion of the BAA map made from observations of the 2001 opposition. The dark projection hanging down from the middle of Mare Cimmerium has a round blob on the north end. This is Gale crater where Curiosity is exploring. 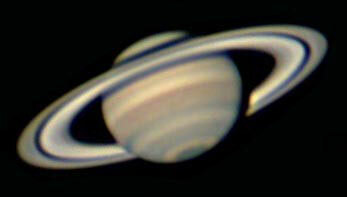 For the images of Jupiter and Saturn, see their current pages. August 5, 2018. 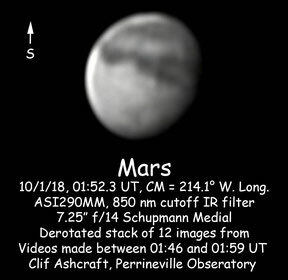 The above image of Mars was obtained with the ASI290MM camera fitted with an 850 nm cutoff long pass infrared filter and a 1.5x Barlow lens at the f/10 focus of the 13" Schupmann Medial telescope at MacGregor Observatory, Stellafane East. 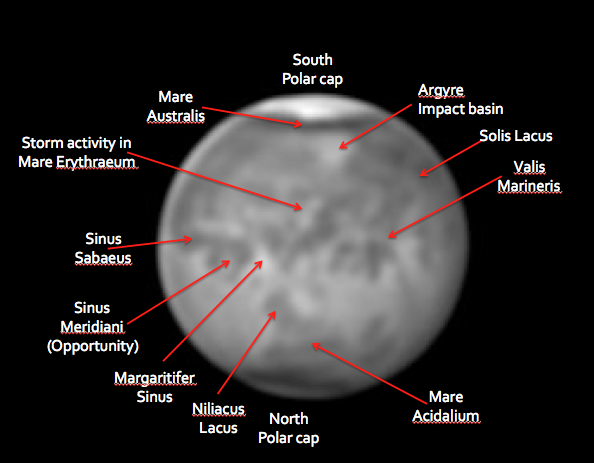 Numerous identifiable surface features are visible, including Sinus Meridiane,Mare Acidalium, Mare Erythraeum and Vallis Mariners. The white feature just below the South Polar cap is the large impact feature Argyre. It's depth is exceeded only by Hellas. Still full of dust. RGB imaging in visible light only shows vague indications where Mare Erythraeum is and the Pole Cap. See image below with latitude longitide grid. July 19, 2018. 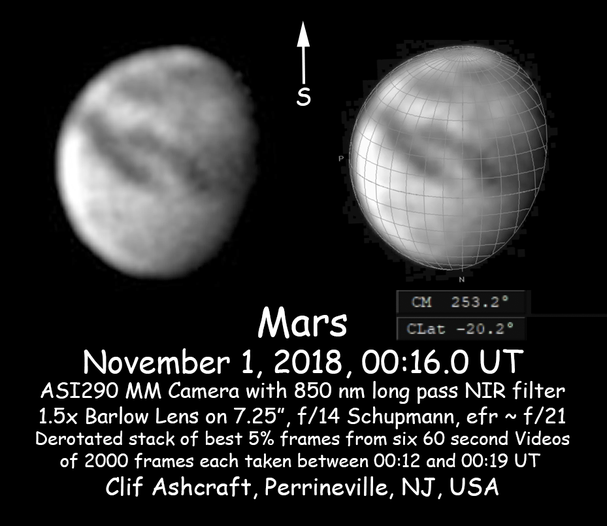 The image shown at the left is a de-rotated stack of 9 images obtained from 120 second videos taken with an ASI390MM camera equipped with a #25 deep red long pass filter and the optics from a 2x shorty Barlow screwed onto the nosepiece. Effective focal ratio on the C11 is f/17.1. The central meridian is 217.6° west longitude. The eastern part of Mare Cimmerium appears dark in my image, but not in the Starry Night simulation. 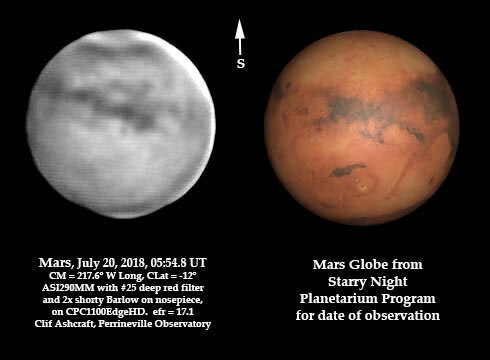 The reason for this is that the Starry Night simulation is based on the appearance of Mars after another global dust storm which left a layer of reflective dust covering this region. More recent images show it dark (the dust got blown away) as it appears in my image and the BAA map. It is interesting that Elysium Mons (the volcano in the Elysium region) does not show up in my image. I take this to mean that the volcano summit is not high enough to poke through the dust layer or that the dust is unusually thick here. 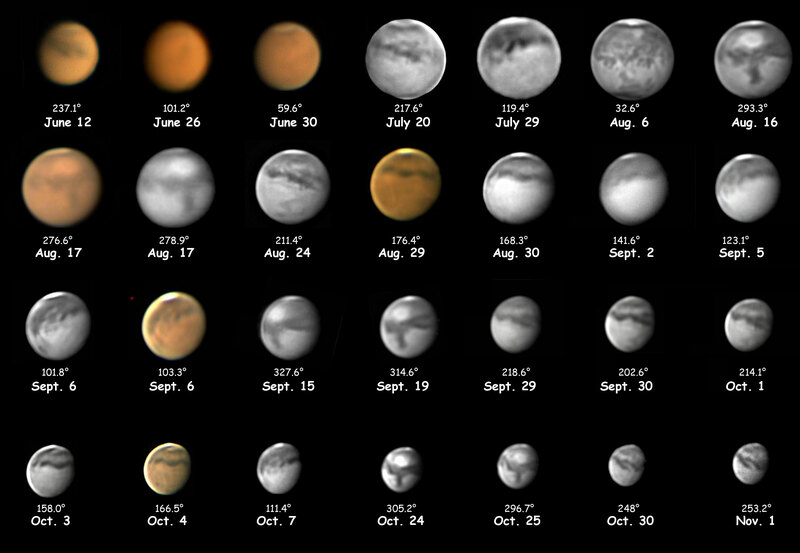 From July 25 til past opposition, Olympus Mons and the volcanos of the Tharsis Ridge will be facing Earth. I expect to see them sticking up through the dust even if the storm has not subsided since their entire summits and calderas are above 20 km altitude. standard for nomenclature of albedo features. June 30, 2018. 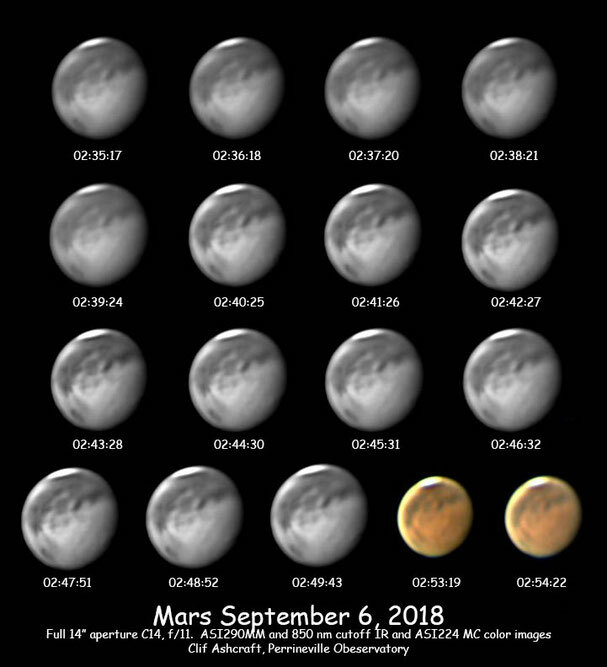 This is an animated GIF made from a set of 14 images of Mars taken with the ASI224MC, ZWO atmospheric dispersion corrector 2x Barlow on the C14. Focal ratio was about f/27. Seeing was below average. Note the dust is obscuring nearly all surface features except the south polar cap.